Excellent Science. Participation in contests for European Research Council scholarships for best scientists and junior researchers. Industrial Leadership. Research projects for leading industry in the EU in areas such as ICT, nanotechnology, advanced manufacture, robotics, biotechnology and space industry. Societal Challenges. Implementation of novel projects which aim to solve the issues related to the seven societal challenges indicated by the Horizon-2020 programme, such as health, demographic change & wellbeing, food security, sustainable agriculture and forestry, secure, clean & efficient energy, secure societies, etc. Technology for diagnostics and measurements. Technology for information, communication, bioinformatics and biotechnology, health care and food. Scientists of the Institute are researching micro relief, plasmonic structures, microstructures for solid oxide micro fuel cells, hydrophobic surfaces, diamond-like carbon and diamond like nanocomposite coatings, are developing new periodic and holographic relief structure replication methods and nanocomposite formation. Research results were applied for micro and nanodevices and structures, many of which in the area of document anti-counterfeiting solutions. All of these areas are of upmost importance for Lithuanian and EU industry. The scientific potential of scientists and researchers of KTU Institute of Materials Science has gained global reputation by participating in national and international fundamental research and R&D projects. “Fabrication and evaluation of two dimentional regular nanostructures”, Dainius Virganavičius (technological sciences), scientific supervisor Prof Dr Sigitas Tamulevičius. “Materials and Microstructures for Micro Solid Oxide Fuel Cells”, Jolita Sakaliūnienė (technological sciences), scientific supervisor Prof Dr Sigitas Tamulevičius. “Diamond Like Carbon Films and their Nanocomposites: Deposition and Investigation of the Piezo resistive Properties”, Andrius Vasiliauskas (technological sciences), supervisor Dr Šarūnas Meškinis. “Surface Morphology, Cohesive and Adhesive Properties of Physical Vapour Deposited Chromium and Chromium Composite Thin Films”, Algirdas Lazauskas (technological sciences), supervisor Dr Viktoras Grigaliūnas. “Amorphous Carbon Based Nanocomposites for Optical Applications”, Asta Tamulevičienė, doctoral dissertation (technological sciences), supervisor Prof Dr Sigitas Tamulevičius. “Periodic Micro Structures for Refractive Index Sensors and Diffractive Optical Elements”, Tomas Tamulevičius (physical sciences), supervisor Dr Mindaugas Andrulevičius. “Influence of Structural Materials Properties on Functional Parameters of Microelectromechanical Systems”, Gailius Vanagas (technological sciences), supervisor dr. Viktoras Grigaliūnas. “Synthesis and Analysis of Protective Coatings Produced by Thermal Spray”, Eitvydas Gruzdys (physical sciences), supervisor Dr Šarūnas Meškinis. “Formation and Investigation of Silicon Nitride Films for Membrane Applications”, Marius Mikolajūnas (technological sciences), scientific supervisor Dr Viktoras Grigaliūnas. “Vacuum Plasma Spray Deposition of YSZ-NiO-Ni Ceramic Coatings”, Tomas Grinys (physical sciences), scientific supervisor Prof Dr Sigitas Tamulevičius. “Kinetics of Growth, Sorption Properties and Applications of Evaporable Barium Getter Films”, Audrius Giedraitis (technological sciences), scientific supervisor Prof Dr Sigitas Tamulevičius. 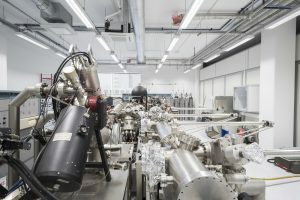 “The Investigation of Electrical and Optical Properties of the Ion Beam Synthesized Diamond Like Carbon Films”, Rimantas Gudaitis (technological sciences), scientific supervisor Dr Šarūnas Meškinis. “Formation of Optical Silicon Structures by Electrochemical Etching Method”, Renata Jarimavičiūtė-Žvalionienė (technological sciences), scientific supervisor Prof Dr Sigitas Tamulevičius. “Processes of Deposition and Testing of Mechanical Properties of Polymers and Metal Coated Polymers”, Brigita Abakevičienė (physical sciences), scientific supervisor Prof Dr Sigitas Tamulevičius. “Fabrication and Investigation of Periodical Structures in Polymers”, Asta Guobienė (physical sciences), scientific supervisor Prof Dr Sigitas Tamulevičius. “Effect of Temperature and Chemical Environment Conditions on Microstructure and Metrological Characteristics of Thermocouple Alloys”, Rita Kriūkienė (technological sciences), supervisor Prof Dr Sigitas Tamulevičius. “Growth Kinetics and Properties of Lead Sulphide Thin Films Deposited on Crystalline Silicon Using Successive Ionic Layer Adsorption and Reaction Method”, Judita Puišo (physical sciences), supervisor Prof Dr Sigitas Tamulevičius. “Investigation of Parameters of Plasma Spray in Low Vacuum on Fabricated Ni-Al Films Electrophysical Characteristics”, Rytis Dargis (technological sciences), supervisor Prof Dr Sigitas Tamulevičius. 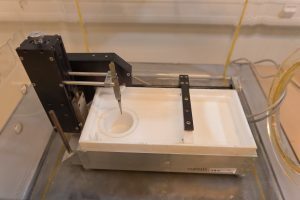 “Thermal Modification of Indium Oxide and Tin Alloy Films, Fabricated by Magnetron Sputtering”, Arnoldas Užupis (physical sciences), supervisor Prof Dr Sigitas Tamulevičius. “The Tribological Properties of Titanium Nitride, Fabricated Using Arc Discharge”, Kazys Babilius (technological sciences), supervisor Prof Dr Sigitas Tamulevičius. The Institute seeks contacts with industrial partners, initiating new contracts and projects. Among them are the leading manufacturers of THz emitters and detectors, and of precise optical metrology equipment, protective coatings for extending the service life of industrial equipment, producers of precision mechanics components, developers of ultrashort pulse lasers and other local and international innovative technological companies. The Institute of Materials Science enjoys international reputation for world-class research, and is acknowledged for its expertise within the University, the Country and abroad. 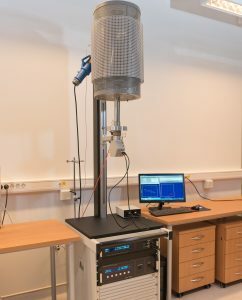 Research findings are applied for Lithuanian laser, electronics, micro technology, mechatronics, polygraph industry by Vilniaus Ventos Puslaidininkiai, JSC Precizika Metrology, JSC Technology, JSC Teravil, JSC Sebra, JSC Lodvila, and other companies. 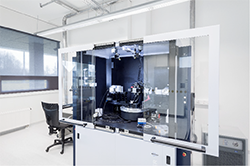 Research results are used for development of new sensors, THz radiation emitters, protective coatings, as well as document anti-counterfeiting solutions developed within the Institute. A spin-off enterprise, Holtida, was created in 2014 for commercialising optical document security elements created at the Institute. The license for safety documents and safety document blanc production was acquired, and a patent claim was submitted: No. 2015 051, name of invention “A Combined Holographic Sticker”. In cooperation with JSC Precizika Metrology during 2011–2013, a joint MITA high tech development program project called “Nanostructured Diamond-Like Carbon Coatings for Novel Optical Metrology Components (NanoDLC)” was carried out (project leader Prof S. Tamulevičius, ca. 73 000 EUR). Results were applied within the company while developing scales for precision laser measurement systems. This product was awarded a gold medal in the national competition Product of the Year 2015. Research carried out by the staff of the Institute is aimed towards micro and nanostructures, microsystems, nanooptics, microelectromechanical, optoelectronic, semiconductor device and related technology development. Research conducted is multidisciplinary and of utmost importance for the society development. Scientific results are disseminated in international conferences, published in top impact factor journals indexed in Clarivate Analytics, Web of Science. The Institute’s staff are also members of editorial boards and referees in various scientific journals. The Institute is the initiator and main organizer of the International Conference-School “Advanced Materials and Technologies” since 1998. This event is very popular among PhD students and young researchers, involved in physics, chemistry and material science areas. This conference is a fantastic opportunity for junior scientists to communicate and find out about the latest research from top of the line researchers that are invited from abroad. The school helps improve general and specific abilities of PhD students and encourages international cooperation. The Institute is involved in activities of the European PhD network “Physics and Chemistry of Advanced Materials” (15 parties from 5 European countries). Prof. Sigitas Tamulevičius was awarded a grant by the city of Kaunas in 2017. This award is given for a multi-year, active and relevant scientific activity, top research achievements and their implementation in the city of Kaunas. Dr. Tomas Tamulevičius was awarded a Lithuanian Academy of Sciences scholarship for young scientists in physical, biomedical, technology and agriculture areas in 2013-2014 and 2017-2018. 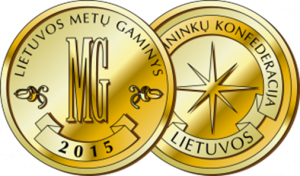 Dr. Algirdas Lazauskas was awarded a Lithuanian Academy of Sciences scholarship for young scientists in physical, biomedical, technology and agriculture areas in 2015-2016. Dr. Jolita Sakaliūnienė was awarded a special prize for the most innovative project in the exhibition-contest “Technorama 2015” (project “Towards Solid Oxide Fuel Microcells”). 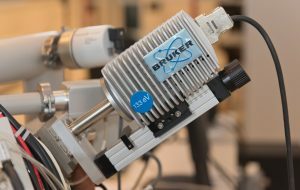 X-ray diffractometer D8 Discover (Bruker AXS, Germany) is used for crystallographic structure analysis of thin films, epitaxial layers, multi-layered structures, synthesized materials or nanopowders. 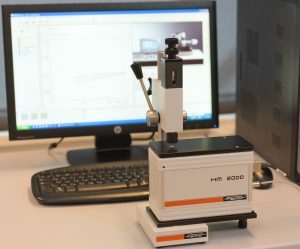 Using the device, it is also possible to determine the thickness of crystalline and amorphous films, do analysis of texture of polycrystalline materials and residual stress of thin films. Specifications: 2.2 kW X-ray tube with Cu anode; parallel beam/Bragg-Brentano geometry; 2xGe(022) crystal monochromator; Goebel mirror (high precision multi-layered crystal monochromator for direct Cu Kα radiation), rotor absorber, spot scintillation detector; 1D LynxEye detector; laser calibrating optics; Euler (X, Y, Z, PSI, PHI) sample holder; CHI and XI automated precision table; reflectometry addition; motorised gap addition; PATHFINDER optics (motorised switch between high resolution and path of high intensity X-ray). Data processing and analysis is carried out using DIFFRAC.SUITE (Bruker AXS) bundle software EVA, LEPTOS, TOPAS and MULTEX. Requirements for samples: ≥ 100 mg powder or ≥ 10 mm × 10 mm substrate; film thickness: 5–1000 nm. Spectral range: 400–4000 cm-1, resolution: 1 cm-1. Measuring modes: transmission, 30o reflection, diffuse reflection, total internal reflection. Spectrometer is created on AvaBench-75 symmetric Czerny-Turner construction base with 2048 pixels CCD detector. It is used to measure intensity of ultraviolet, visible and near infrared light. AvaSpec-2048 is particularly useful when illumination is weak or high resolution is needed. 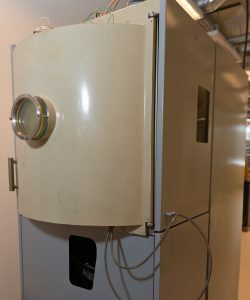 This spectrometer is capable to measure in 172–1100 nm range. Resolution: 1.4 nm. 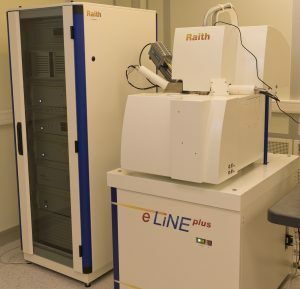 The equipment is used for registration of Raman scattering spectra with con-focal micro-Raman optical system, as well as for measurement of luminescence. It can be used to investigate thin films, powders and liquid solutions. 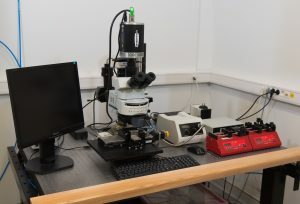 Raman spectroscopy gives information about composition of the material, but it can also be used to determine stress in some types of thin films. 532 nm wavelength, 45 mW power semiconductor excitation laser, 2400 lines/mm grating, thermoelectrically cooled 1024 pixels CCD, Stokes lines measurement mode: 100 cm-1 – 8000 cm-1, resolution: better than 1 cm-1. 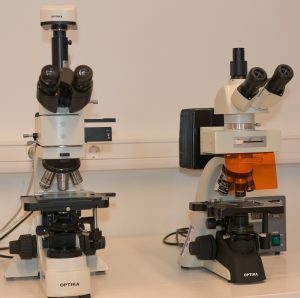 Con-focal Leica microscope with 3 objectives: x20, x50 and x100. Library of 8000 spectra. 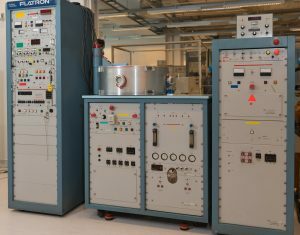 X-ray photoelectron and ion scattering spectroscopy system, ESCALAB 250 (Thermo Fisher, 2013). Monochromatic X-Ray source: Al anode, Ar ion source for ion scattering spectroscopy, reflected electron energy loss spectroscopy; no less than 0.45 eV resolution at FWHM of Ag 3d5/2; visualisation resolution: ≤ 3 µm; double charge neutralization; UV photoelectron spectroscopy system; temperature of the sample: 77 K–1000 K; sample transfer under vacuum, vacuum: ≤ 5∙10–10 Torr. Spectrometer enables to quantitatively and qualitatively evaluate the composition of a sample by detecting chemical elements from B to Am in a selected spot (1 µm3 volume) or mapping the distribution of elements in an area. Modern 30 cm2 temperature controlled (Peltier element) X-ray silicon shift spectrometer detector ensures 133 eV (at Mn Kα line) energy resolution with a very high X-ray photon detection speed (100,000 impulses per second). 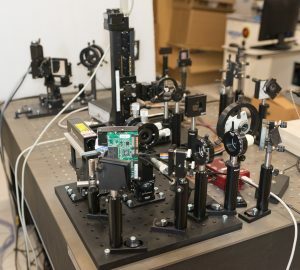 It is a simple double-beam spectrometer employing flame techniques. About 20 elements may be detected (Fe, Cu, Zn, Ni, Pb, Mn, Cd, Ga, Sn, Co, Pd, Pt, Au, Ag, Rh). Atomic absorption is a fast and simple analytical method that is especially useful when a small number of elements have to be determined in a large number of samples with moderate accuracy. 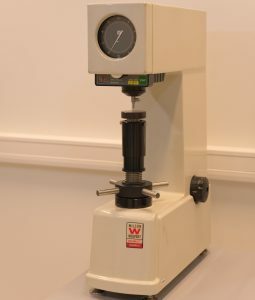 This quantitative analytical technique has many applications particularly in the analysis of water, soil and stone samples. 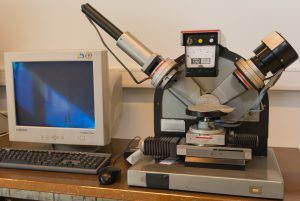 Due to simple exploitation, high speed and accurate analysis makes it one of the most popular methods for the determination of trace metals. Sensitivity of the method is about 0.05-0.1 ppm.Fields of application: ecology, materials engineering and medicine. 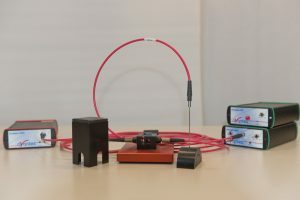 Measurements of current-voltage characteristics, investigation of electrical characteristics of electronic, microelectronic and optoelectronic devices. Voltage: ± 500 V, current: 100 fA–20 mA. For measurements of surface roughness. 1. Ra: 0.03 μm ~6.3 μm/1 μ ~250 μ. 2. Rz: 0.2 μm ~50.0 μm/8 μ ~999 μ. 3. Ry/R max: 0.2 μm ~25 μm/8 μ ~999 μ. Resolution: up to 0.01 μm/1 μ. Measurement length: 0.8 mm/0.30”; ANSI 2RC filter. Measurements of macrohardness. Load: 15, 30, 45 kgf. Investigation of micromechanical properties of thin films and coatings. Available load during the measurement: 0.1–2000 mN. 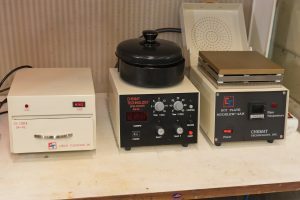 For investigation of electrical properties of dielectric materials, thin films, for testing of components of solid oxide fuel cells in various temperatures. Frequency range: 3 µHz–3 MHz; 2-3 electrodes system; phase: 0.001°. Diameter of sample: 16 mm. Two “in-plane” and “through-plane” measurement configurations. The maximum heating temperature: up to 1200 °C (accuracy 0.1 °C). It is a light source simulating Solar spectrum for photovoltaic measurements of samples. Illumination power: 1 Sun AM1.5G, class A. Deviation of illumination uniformity in beam: < 2 %. Diameter of the beam: 25 mm. Measuring range: 1–180º, surface tension: 0.01–1000 mN/m, accuracy: 0.1º; 0.01 nM/m. Size of the sample: 320 × ∞ × 165 mm (length × width × height). Measurement of surface topography and mechanical, electrical and magnetic properties in air and liquids. Suitable for characterisation of solids, polymers, biological samples and molecules. Also suitable for nanomanipulation and nanolithography. 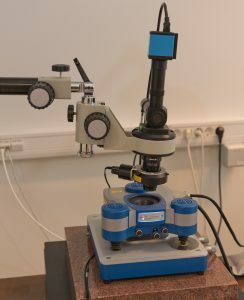 Working modes: contact, tapping, non-contact; microscopy of lateral force; record of phasic image; force modulation distribution (force mapping); quantitative representation: surface image based on force curves; magnetic force microscopy; force-distance spectroscopy; force-distance volume imaging mode; nanolithograhy and nanomanipulation; conduction microscopy with I/V curves registration; Kelvin probe force microscopy; capacitive microscopy. Scanning field: 100 × 100 µm; height up to 15 µm. Samples up to 100 mm in diameter and 50 mm in height. 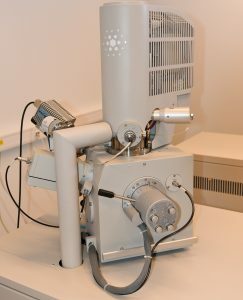 Scanning electron microscope FEI Quanta 200 FEG (FEI, USA, 2007) with energy dispersive X-ray spectrometer Bruker XFlash 4030. 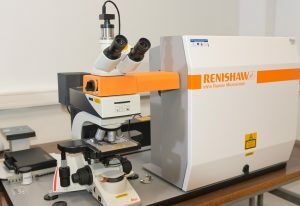 It is one of the principal technology tools used for imaging of nanostructures, nanodevices and surface. 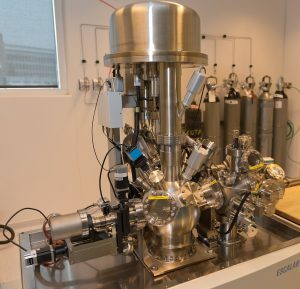 A contemporary field emission electron source permits working in controlled pressure water vapour atmosphere, thus this microscope is capable in investigating electrically nonconducting objects with high 1.2 nm resolution (resolution – minimal recorded dimension). Resolution in high vacuum is up to 1.2 nm (30 kV, SE), up to 2.5 nm (30 kV, BSE), 3 nm (1 kV, SE). Three vacuum working modes: high vacuum (< 6e-4 Pa), low vacuum (10–130 Pa), even lower vacuum (10–4000 Pa). It is possible to investigate conductive and nonconductive samples. 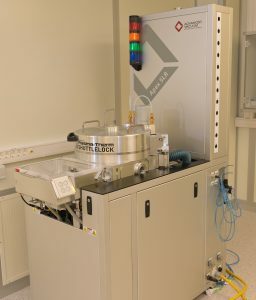 Optical microscope with fluorescent addition OPTIKA (Bruker, Germany, 2011). Investigation of surface of various materials and micrometric measurements, fluorescence analysis. Wide-field eyepiece with micrometre scale, digital camera, fluorescence addition. Magnification: x1500. Samples up to 100 mm in diameter and 50 mm in height. 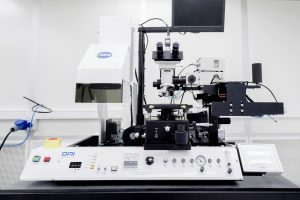 It is used for automatic size investigation of optically transparent structures (measurement uncertainty: 0.1+L/500 µm, where L – size of measured structure). Magnification: 1200. 800 times magnifying analyser-comparator Nikon (model N2) is used for investigation of structure size in transmittance and reflection modes. This analyser-comparator is very useful in measurement of plane topological step error. Analyser’s applications: control of photo mask, step error, control of semiconductor chips. 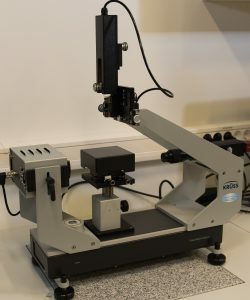 Device can be used for thin, isotropic and anisotropic, transparent and opaque layers on isotropic and anisotropic, transparent and opaque substrates optical constants (k(λ), n(λ)) and thickness measurements; evaluation of periodic structure linear dimensions (scatterometry); measurements of absorption kinetics in solutions. 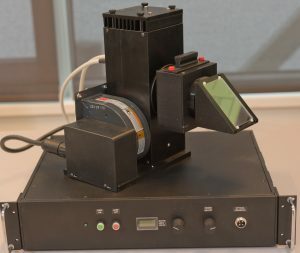 Spectroscopic ellipsometer covers UV-VIS-NIR spectrum. Measurement angles: 12–90° with the resolution of 0.01°, ability to measure using a focused beam (70 µm × 150 µm). High resolution detector: UV-VIS (190–900 nm) with the resolution of 0.5 nm, high speed UV-VIS detector (190–900 nm): 1024 wavelengths, high resolution NIR detector: 800–2000 nm with the resolution of 3 nm. 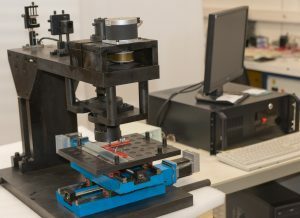 Automated sample translation stage with digital imaging. 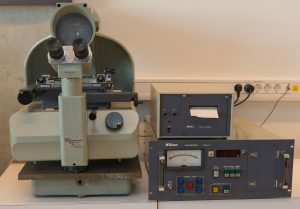 Laser ellipsometer Gaertner L-115 is used for measurements of thickness and refractive index of thin dielectric and semiconducting films. Laser ellipsometry is based on the analysis of parameters of polarisation of monochromatic polarised light beam reflected from the sample. Length of the light wave used is 632.8 nm. Thickness of films possible for analysis: 0.001–1 µm. Uncertainty of thickness measurements is ± (0.5–1) nm. Accuracy of the refractive index measurements: ± 0.01. Application areas: measurements of refractive index and thickness of the dielectric and semiconducting thin films, semitransparent thin metal films (< 50 nm), polymeric thin films (e.g. photo resist). System is used for nanolithography, nanostructuring and materials surface and composition analysis. 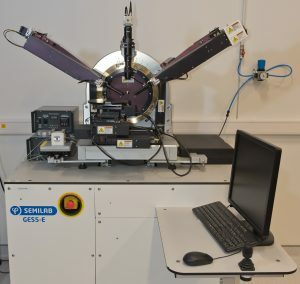 Electron beam energy is changing in range 20 V–30 kV; 1 nm positioning accuracy in 100 × 100 mm field; diameter of round sample: up to 100 mm (4“), size of rectangular sample: up to 102 × 102 mm; magnification of scanning electron microscope with “in-lens” and Everhart-Thornley type detectors up to x1,000,000; energy resolution of energy dispersive spectrometer Bruker QUANTAX 200 with 5th generation Si detector: < 129 eV, allows to detect elements from Be (Z = 4) to Am (95). Precision alignment with photomasks, exposure of thin photoresist layers by ultraviolet rays. Suitable for round substrates with diameters of 50, 76, 102 mm and for non-standard samples which are at least 5 × 5 mm2 in size, substrate thickness: up to 1 mm, thickness of photomask: up to 4.8 mm. The distance between the substrate and photomask is adjustable up to 50 μm. Ranges of ultraviolet light wavelengths: UV400: 350–450 nm; UV300: 280–350 nm; UV250: 240–260 nm (deep UV radiation). 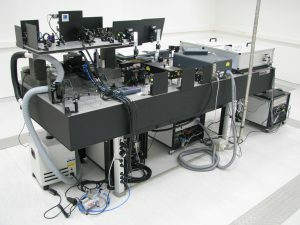 UV nanoimprint lithography supplement, supplement of double-sided alignment using infrared light. Power of exposure source: 500 W. Deviation of illumination uniformity does not exceed 3 %. Resolution: no less than 0.5 µm. Vacuum evaporation equipment A7000E is used for fabrication of metallic and dielectric films. The thickness of formed samples is controlled by microprocessor and quartz thickness meter. 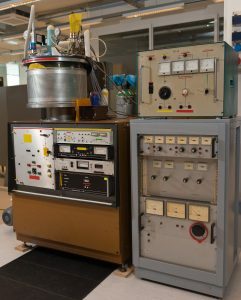 Parameters of the equipment: Vacuum in a chamber 10-4–10-5 Pa; Two 6 kW power electron guns with four rotating position crucibles. Substrates temperature: 20–400 oC. Used for growing Epitaxial GaAs layers, the control of grown films. 8 heated chambers are dedicated for the growth of epitaxial GaAs layers, 8 shutters are controlled by computer. Samples are transported in vacuum, no less than 1*10-10 Torr. 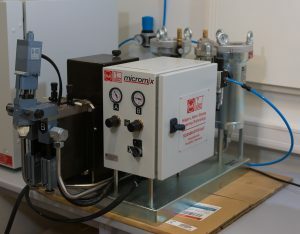 Equipment for obtaining (Π-A) isotherms and fabrication of mono- and polymolecular organic structures on solid surfaces using Langmuir-Blodgett (LB) method. 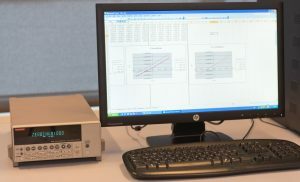 The equipment consists of LB bath, electronic control unit and personal computer with Windows 98/2000/XP operating system to launch the control programme. Parameters of the bath: Free surface area: 400 cm2; Working surface: 318 cm2; Liquid volume: 1000–1050 cm3; Surface pressure meter: Wilhelmi plate (error 0.1 mN/m). Dimensions of well: depth – 75 mm, diameter – 60 mm. Ni film fabrication on plastic surface. Volume of electrolysis bath is 65 litres. Electrolyte – nickel plating vitriolic with special additives (brightener, coating hardener). The required temperature is kept constant by electronically controlled heating element. 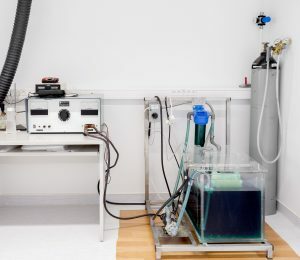 Electrolyte is mixed using mechanical stirrer and by pumping it through textile filter. Anode – titanium cage filled with Ni+0.1 % NiS pellets, dissolving during electrolysis. Electric current is supplied from alternating current intensity electricity rectifier (Imax = 0 – 30 A). Quantity of electricity (A/h) is measured by especial meter. Surface area of Ni layer is up to 500 cm2. Spin coater, hotplate and UV lamp for thin film fabrication. 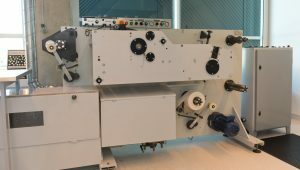 Spin coater can be set for two different duration intervals (2–18 s and 3–60 s) and rotation speed (500–2500 RPM; 1000–8000 RPM) processes. Hotplate temperature: 30–300 °C, sample size: up to 6“, temperature resolution: 0.1 °C. UV module has 4 6 W lamps, wavelengths 246 nm and 365 nm, sample can be rotated (4“, 6 RPM). Ion-beam diamond-like carbon (DLC) deposition device URM 3.279.053. The device is designed for ion-beam deposition process of DLC from hydrocarbon and dopant materials. Main parameters of the device: Base pressure in chamber: 4·10-4 Pa; Pressure during DLC synthesis: (1-2)·10-2 Pa; Accelerating potential of ion-beam source: max 2 kV; Ion beam current density: 0.05–0.25 mA/cm2; Current of solenoid: 6 A. Gases: both inert and reactive gases can be used. Microwave plasma activated chemical vapour deposition system CYRANNUS I-6” (IPLAS Innovative Plasma Systems GmbH). Crystalline diamond, carbon nanotubes, graphene fabrication. Diameter of plasma source: 6“, power of plasma source: 6 kW, frequency of plasma: 2.45 GHz, diameter for uniform deposition: 5 cm. 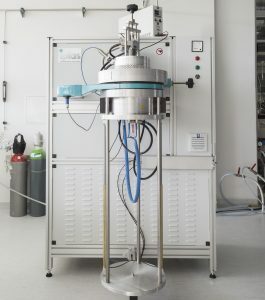 The device is designed for plasma enhanced chemical vapour deposition of dielectric SiN films from monosilane, ammonia gas and for etching of SiO2, Si3N4 films. 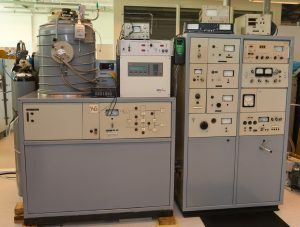 Main parameters of the device: Base vacuum in chamber: 1.3 Pa; Technological pressure in chamber:13.3– 1330 Pa; RF generator power: 0–3 kW; Frequency: 13.56 MHz; Temperature of the substrate: 20–350 oC. Gases: SiH4, NH3, N2, CF4, O2, CHF3, Ar. Deep reactive ion etching for microfabrication processes and formation of nanostructures. Uniformly etched area diameter: 15 cm. 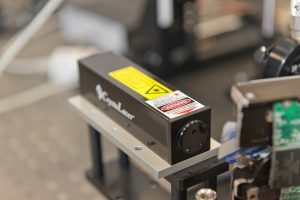 The device is designed for ion-beam etching of semiconductors and metal microstructures. 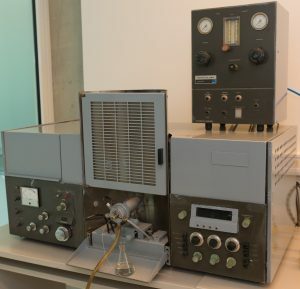 Main parameters of the device: Base vacuum in chamber: 5∙10-4 Pa; Technological pressure in chamber: 7∙10-2 –4∙10-1 Pa; Ion-beam energy: 0–00 keV; Ion-beam current density: 0.01–0.30 mA/cm2; Gases: Ar, N2, O2, He, C3F8. Deposition of ordered arrays of microparticles from their colloidal suspensions on a template. Process can be monitored using an optical microscope with a dark field interference contrast function. Able to mix PDMS elastomer and its curing agent at a ratio of 1:10. Minimum volume: 1 ml. Single use passive mixers are used. Able to mix up to 250 ml viscous fluids (dedicated for PDMS). 375 nm wavelength and 15 mW power laser. Holographic lithography, micromachining. Structures with period of 188–323 nm can be fabricated (interference angle: 80–35º, respectively). Fabrication of dot-matrix hologram master in a photoresist layer. Wavelength of laser light: 405 nm. 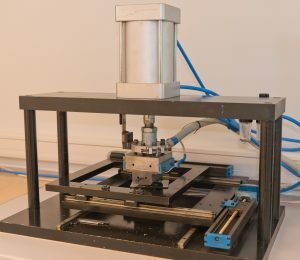 Dimensions of fabricated dot-matrix: 200 × 200 mm2. Resolution of choice: 317; 600, 1200 dpi. The equipment is suitable for printing of holograms and diffractive optical elements in multi-layered polymer films. Additional functions: fabrication of adhesive layers on polymer film or siliconized paper; cutting. Fabrication of optical document and intellectual property security mediums with microdiffractive elements. 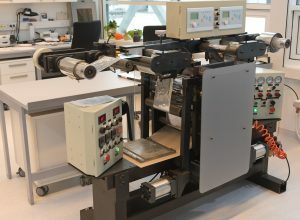 Printing of optical security labels in multilayered polymer film (belt). Fabrication temperature: 50 oC–180 oC, width of belt: 160 mm, length: 1000 m, thickness: 16–100 µm, printing speed: 0–10 m/min. Duplication of microrelief on plastic surface. Fabrication of submicrometric (nanometric) dimensions relief on plastic surface. Fabrication temperature: 20 oC–200 oC, pressure: 0–900 KPa, area 200×200 mm2. By using the solutions our researchers have developed, we help our customers with their technological problems. Cooperation with the customers ranges from simple single time orders and tests all the way to common research and development projects and other services. The reservation of the equipment can be done using the KTU Open Access Center. The research teams working at the Institute are conducting high level international, national, institutional projects, are taking part in R&D activities for business, industry and state organisations. Researchers and scientists of the Institute are developing technological solutions that are applicable and can be adapted to needs of various manufacturing processes. Scientific papers published by the institutes staff. Scientific journal “Materials Science – Medžiagotyra”. Chief Editor – Prof. S. Tamulevičius, Referees – Dr. D. Jucius, Dr. Š.Meškinis, Dr. M.Andrulevičius, Dr. V. Grigaliūnas, Dr. R. Gudaitis, Dr. E. Fataraitė-Urbonienė, Dr. T. Tamulevičius, Dr. A. Tamulevičienė, Dr. A. Guobienė, Dr. A. Lazauskas. Refereeing and editing of the books of abstracts for International Conferences “Advanced Materials and Technologies” and “Nanotechnology and Innovation in the Baltic Sea Region”. Referees for journals published by Elsevier – Dr. Š. Meškinis, Dr. A. Lazauskas, Prof. S.Tamulevičius, Dr. V. Grigaliūnas, Dr. A. Guobienė, Dr. M. Andrulevičius, Dr. T. Tamulevičius. The Institute is the organizer of the International Conference “Nanotechnology and Innovation in the Baltic Sea Region” since 2017.